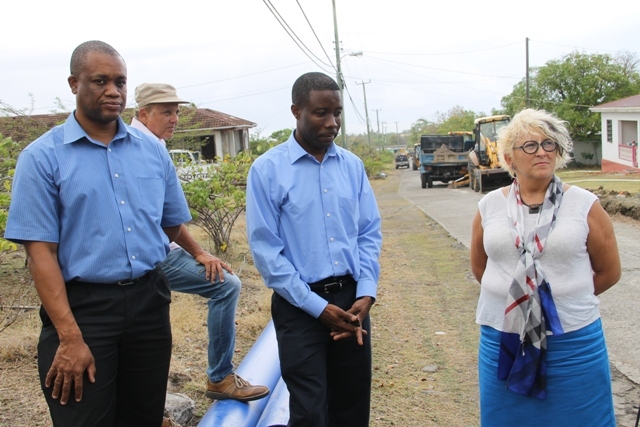 NIA CHARLESTOWN NEVIS (APRIL 21, 2015) — The Caribbean Development Bank’s (CDB) newly-appointed Civil Infrastructure Engineer for St. Kitts and Nevis Dr. Anna McCrea, says the ongoing CDB-funded multimillion dollar Nevis Water Supply Enhancement Project is on budget and expressed satisfaction with the project. Dr. McCrea made the disclosure while on a supervision mission to examine the project’s progress at Camps Village on April 16, 2015. She was accompanied by Portfolio Manager of the Economic Infrastructure Division, William Ashby and Operations Officer (Civil Engineer) and Water Specialist Lennox O. Lewis, the outgoing supervisor of the project. “I got a chance to study the project details and talk to the project team here on the ground and I must admit, I am very impressed with the amount of work which has gone on so far. “The project is on budget. Still small delays here and there but they are manageable and we are on top of them,” she said. The CDB official described the overall benefits of the project to the island as indisputable. She expressed hope that the first phase would be completed by the end of 2015 and the second phase, which she said was an extension that they were about to identify, would be completed by the end of 2016. Meantime, Lewis who had been assigned to St. Kitts and Nevis for some years said, the CDB’s sole purpose is to improve the life of the people of the Caribbean and to alleviate poverty and the ongoing Nevis Water Supply Enhancement Project, once completed, would be used by the bank as an example of its successful partnership with a country. He was pleased the project was being implemented in an efficient manner and expressed satisfaction with the work already done. 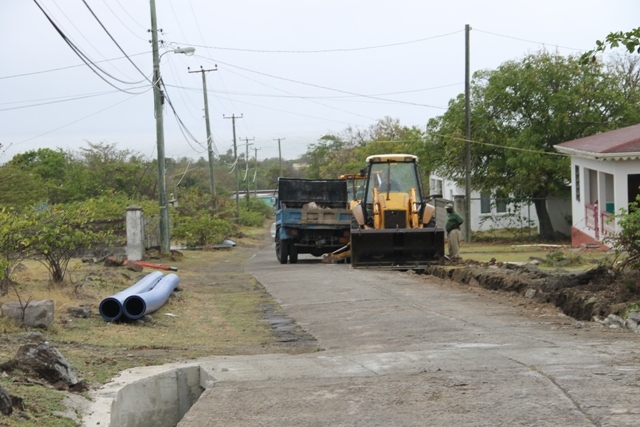 The CDB engineer said he looks forward to the project’s completion and the realisation of the many benefits it would accrue to the people of Nevis. Lewis thanked Junior Minister responsible for Public Utilities Hon. Troy Liburd and his team for the courtesies extended and said he looks forward to future collaborations. “One of our objectives here is to discuss future work. We are involved in many sectors: in air and sea ports, disaster mitigation, climate change adaption projects. There are many opportunities for collaboration and we are having discussions with the various government departments. “There is potential for more [work] and it being discussed in a proactive way between us and the government,” he said. Ashby noted that the CDB had been a development partner with Nevis for many years. He said the Nevis Water Supply Enhancement Project is one of many the CDB had been involved in within St. Kitts and Nevis over the years. 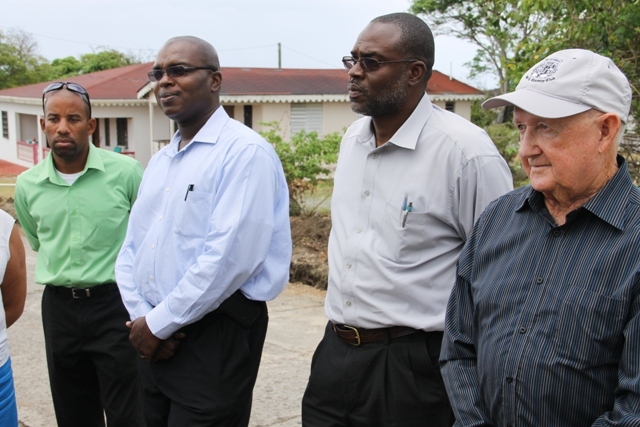 The portfolio manager stated that, he along with Dr. McCrea, had been assigned to St. Kitts and Nevis so the April 16 visit to Nevis was the first of many to oversee projects on Nevis.